When we spend a lot of time in a space, the sound, shadows, and ambience almost become part of our subconscious. The creakkkk of a floorboard as we walk through the living room. The drip of coffee slowly filling the pot in the morning. The rustle of pine boughs in a favorite patch of forest. The harsh call and boastful flash of color from red-wing blackbirds in a marsh. Our happy memories in these places make them special to us. Wild lupine in a prairie at Highland State Recreation Area, May 2017. What about the natural spaces that have (almost) ceased to exist in our everyday lives? The prairies and oak savannas of Oakland Township used to have a signature rustle in the evening breeze. Fields of brightly lit prairies were punctuated by speckled shade under oak groves, and seasonal bouquets of native wildflowers marked the transition from spring to summer to fall. 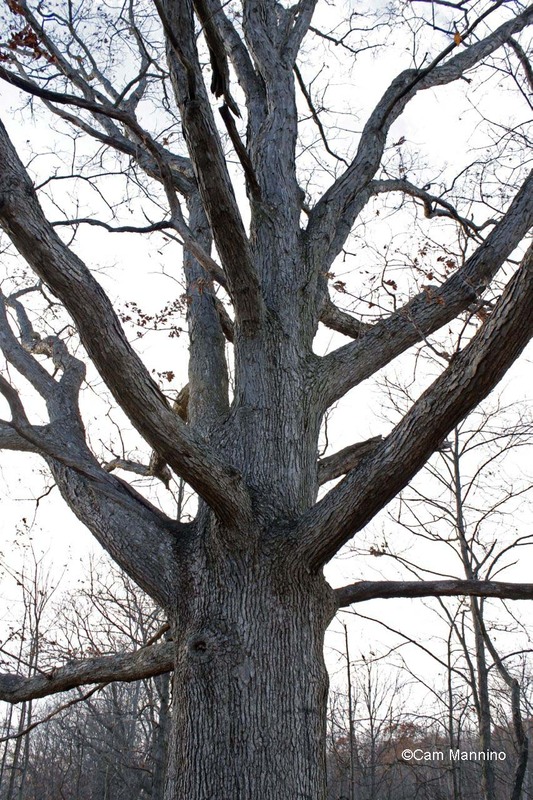 Until a few decades ago, the inhabitants of our township had been intimately familiar with the sights and sounds that defined our open oak lands in southeast Michigan for thousands of years. We now assume that all fields should eventually grow into shrub thickets, then forests. 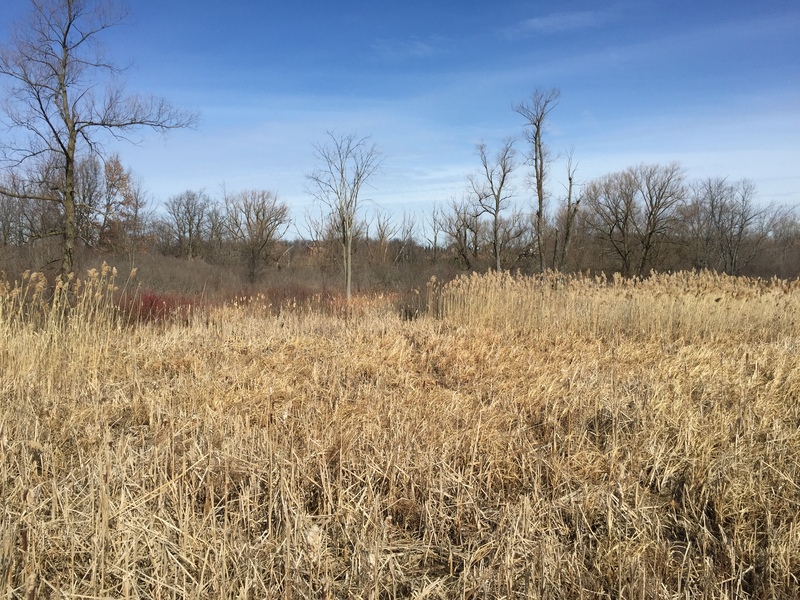 But many plants, birds, insects, and other wildlife are prairie and savanna specialists, with connections to each other that were formed by living together in this landscape. They depend on us re-awakening memories of these fantastic, forgotten fields, doing the important work of making them new. The western slope at Bear Creek Nature Park was one of the units we burned in March 2018. This view is from August 2017. Photo by Cam Mannino. So two weeks ago, with the help of our volunteer prescribed fire crew, that’s exactly what we set out to do. We assembled around noon at Bear Creek Nature Park. All the staff and volunteers that help on our burns have been trained to do prescribed fire, so they know the drill when they arrive. We double-checked our pre-burn list: introduce everyone on the burn crew and write names on helmets… check; call the fire department… check; walked trails around the burn unit… check; tested equipment… check; everyone is wearing the right gear… check; weather and fuels meet our burn prescription… check. After reviewing the plan for the day, we headed out to begin burning. The fine grasses were nice and dry, though small patches of snow lingered in the shade on a north-facing slope. The western slope at Bear Creek Nature Park on the morning of March 23, 2018. We started on the down-wind side, slowly letting the fire creep into the burn unit. Fire slowly backs into the wind. As we built up a safe, burned buffer on the outside of the unit, we lit parts of the interior. The mowed trails kept the fire exactly where we wanted it, though we checked them often during the burn just to be sure. Mark lights part of the burn unit using a drip torch. As we worked around the burn unit, we let the fire creep through patches of invasive autumn olive and multiflora rose. The slow-moving flames will do more damage to the shrubs than a fire that passes quickly. Joan watches fire advance slowly into the shrubs. Photo courtesy of Mike & Joan Kent. After we got around the outside of the burn unit, we stepped back to let the fire crawling through the interior finish its work. Then we walked through the area one more time to put out anything that was still smoking. Fire crawls through a patch of trees at Bear Creek Nature Park on March 23, 2018. Photo courtesy of Mike & Joan Kent. After burning the available fuel, the fire slowly extinguishes itself. Photo courtesy of Mike & Joan Kent. We had a nice mix of experienced staff, returning volunteers, and new volunteers. By the end of the burn, everyone got a chance to try the different pieces of equipment and responsibilities on the burn crew. And we had fun! Alex, Joan, Mike, and Dan are all smiles after a good burn at Bear Creek Nature Park on March 23, 2018. Photo courtesy of Mike and Joan Kent. The fire likely top-killed the invasive shrubs in our burn unit. We’ll still need to treat any that sprout again in the summer, but fire did a lot of work for us in a few hours. The black soil will warm more quickly than areas that haven’t been burned, extending the growing season for the plants. In a few weeks we’ll see a fresh fuzz of green growth carpeting these areas. We will spread seed of more native grasses and wildflowers so that they can establish in the newly opened soil. The western slope at Bear Creek Nature Park after our burn on March 23, 2018. That March afternoon was a fine day for making new memories. Our memories of working together as a team to restore grassland habitat are an important part of natural areas stewardship. We only care for the things we value. The township residents that walk these fields will see the dramatic change, watch the landscape grow over the summer, and make their own memories. Hopefully most of the visitors will see the signs we posted, explaining why we use prescribed fire. A few will go home a look up more information. And maybe some will join our team next time we do a prescribed burn! The farm house at what is now Bear Creek Nature Park as it appeared in 1939. Long before 107 acre Bear Creek Nature Park had official trails or a play area or decks at the marsh, it was a farm with chickens, ducks, cows, orchards and a garden. The Comps family rented the house on that farm from 1939 until they moved to their own home on Silver Bell Road in 1959. George Comps, a boy when the family moved there, wrote a long book called Incredible Yesterdays (published by Ravenswood Press, 1997) about his years on that piece of land. The book is available at the Rochester Hills Library in their local history room, the Oakland Township Historical Society and the Rochester Hills Historical Museum. All the quotes and black-and-white photos below are from Mr. Comps’ book, whose long-time friend and copyright heir Janet Potton gave me permission to use photos and quotes. 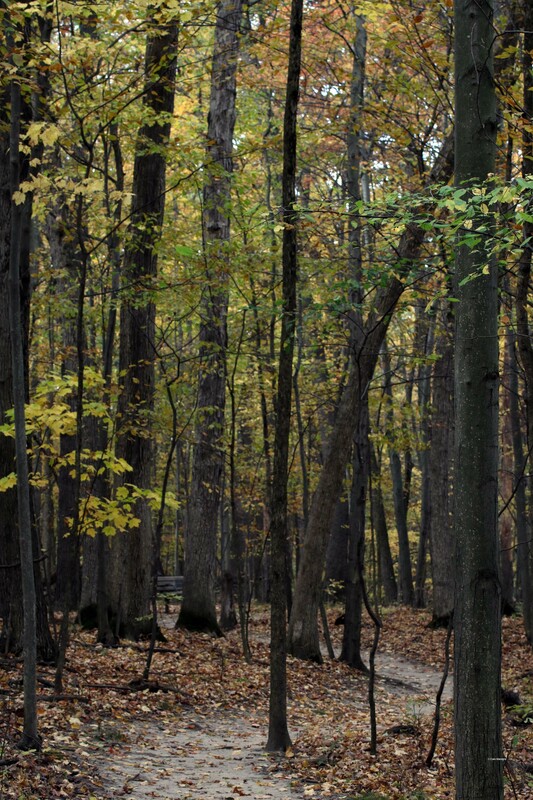 What an intriguing look Incredible Yesterdays provides of Oakland Township’s oldest publicly protected park as it existed 75 years ago! Bear Creek’s land was a source of sustenance, heat, income, play, beauty and peace for the Comps family during difficult times. So join me for a short visit to Bear Creek as it looked during the Great Depression and through the Second World War (current map of Bear Creek here). It was a very different world, but oddly familiar. What Bear Creek Provided in the 1940s: Warmth and Food! In 1939, during the Great Depression, the elder Mr. Comps lost his job and the family moved from Rochester to the home you see in the photo at the top of today’s blog. The Great Depression made life challenging for the Comps family. Unlike their house in town, this house had no electricity, no running water and no central heat at that point! But the owner, Mr. Devereaux, agreed to let them stay rent free for a year if they fixed the place up. 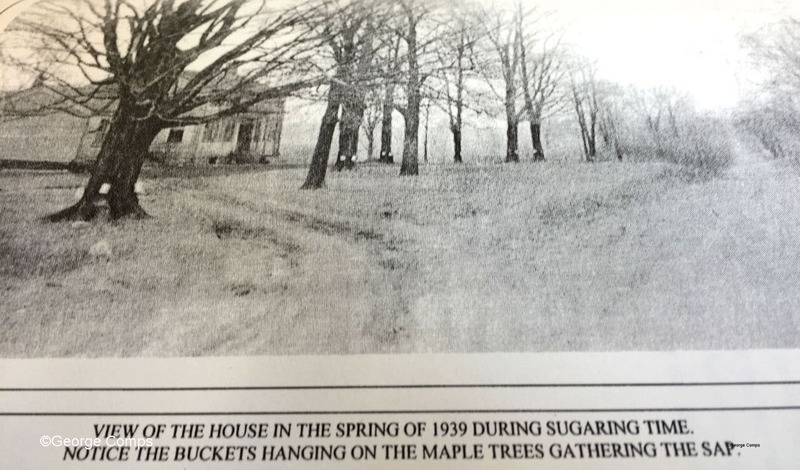 So the maple syrup buckets on the trees in the photo no doubt provided a sweet treat much appreciated by the family! The woods where the Comps’ family cut wood to heat their home in 1939. 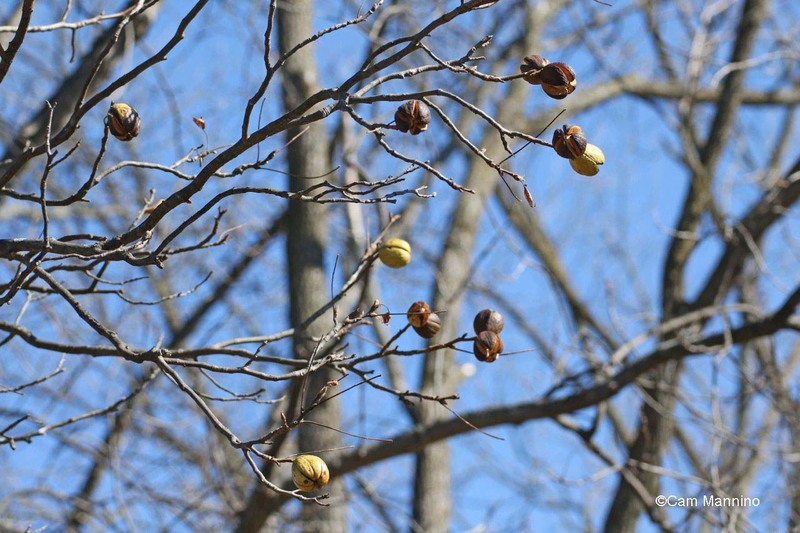 Hickory nuts at Bear Creek were a source of food in 1939 and still grow in the park. Bees provided the honey the family found in a huge “bee tree,” an oak they cut down to get to the honey. 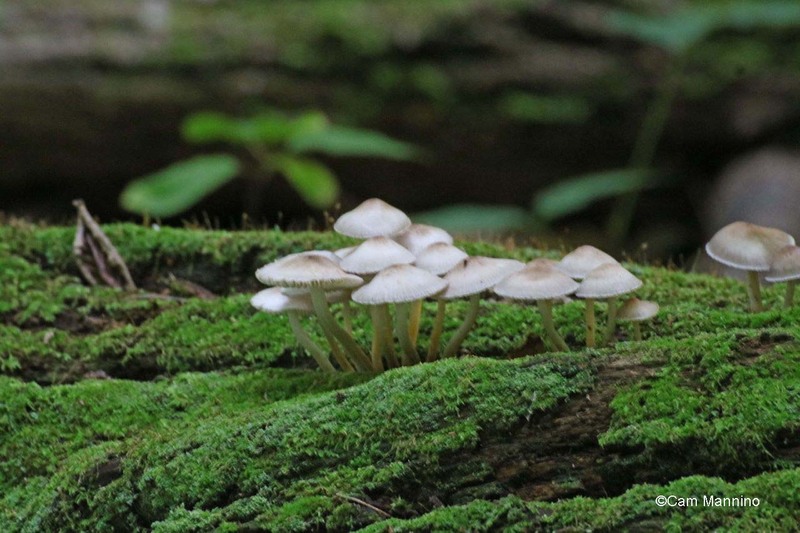 There were mushrooms on the farm, but Comps’ mother decided not to eat them, not being sure they were edible. Two Italian men came to the house shortly after the family moved in asking for permission to hunt for mushrooms. Permission granted, “They did come, several days in a row, and they always had a big basket of mushrooms.” Mrs. Comps’ didn’t charge the gentlemen for their mushrooms and when they offered her some for the family, she graciously accepted them, but then decided she wasn’t quite sure they were edible and threw them away – a wise thing to do if you don’t know much about mushrooms. 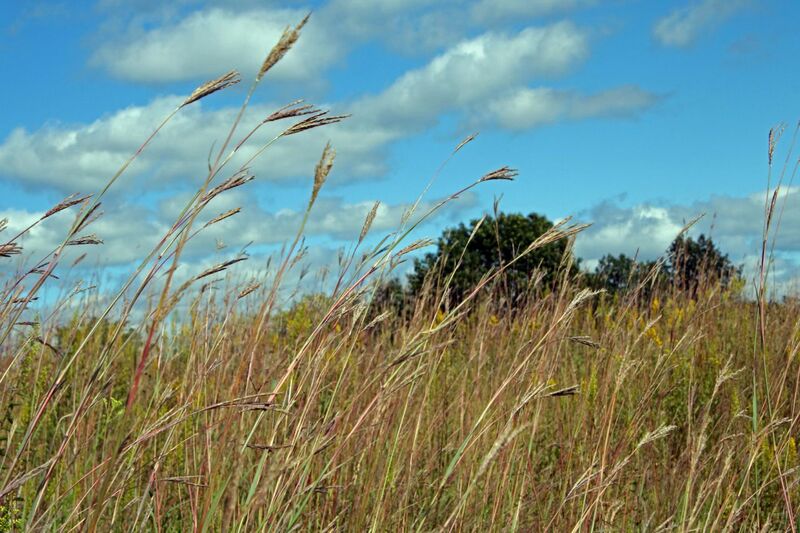 Hunters also came to hunt pheasants because at that time open fields and remnants stands of native grasses, like the Big Bluestem (Andropogon gerardii) in the photo below, would have provided lots of ideal cover for them. 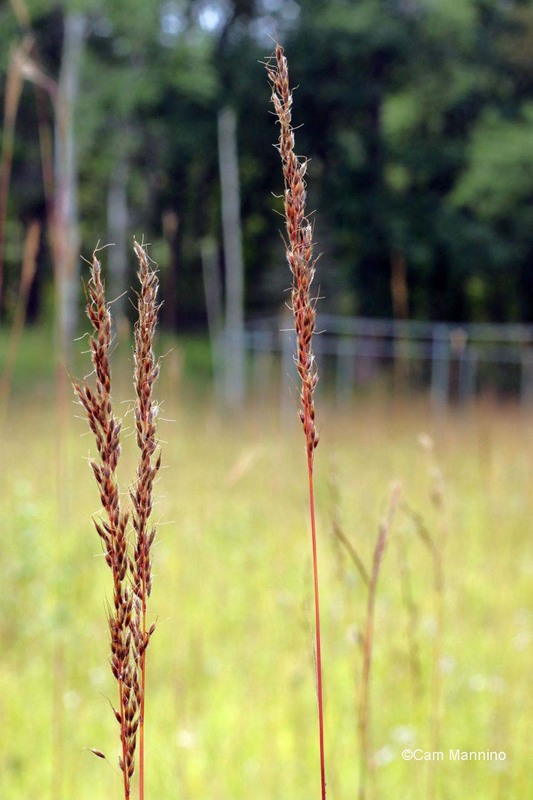 Big Bluestem, a typical prairie grass that was probably more common in Oakland Township in the 1940s. And of course the family had a garden as well. So the land that later became Bear Creek served the family well in terms of warmth and nourishment. What Bear Creek Provided in the 1940s: Beauty! Despite the hardships of the Depression, the Comps family made time for simple pleasures. When the skies were darker at night in Oakland Township than they are now, the family enjoyed the startling beauty of the Northern Lights. 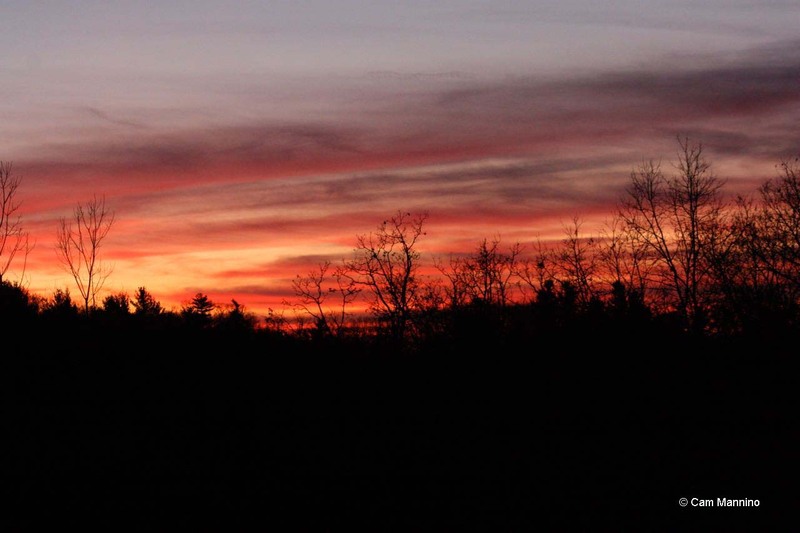 “It was an astounding sight when the sky would light up with all the colors from all around. The streaks of light would shoot up so strong and even from the south and make it look like you were standing under an umbrella of light. Directly overhead the shafts of light would meet but wouldn’t come together, creating a hole in the display … Just awe inspiring.” The skies in Bear Creek are still beautiful, but brighter night skies from nearby development makes seeing the northern lights a rare occurrence these days. Wild trillium once covered a hill in the forest that sloped to Gunn Road. Now they are a bit rarer in the park. There was a 25 cent bounty on Groundhog ears paid by the township in the 1940s. The bounty on a crow’s head was a dime. Muskrats pelts had value too. George’s older brother, Bud, trapped muskrats in the pond and the swamps. At first, he didn’t have the knack. But “After talking to the Old Timers at the Goodison store, he gained valuable information about where to put the traps and how to secure them … On his second trip to gather his loot he did very well.” Skinning and preparing the pelts for drying was “more than he bargained for” but he did it for two winters and “gave the money to mom to help alleviate the strain on the budget.” So nature provided a little assistance in a hard time for many families – but I’m glad now these creatures can live peacefully in their native homes. 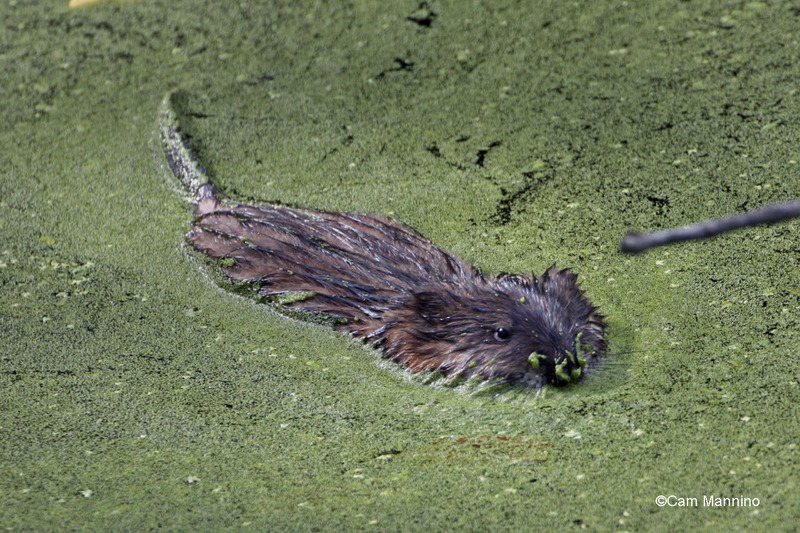 A muskrat peacefully cruising through the duckweed, safe from losing its pelt like it did in earlier times. What Nature Provided in the 1940s: Fun! Excitement! But those barrel staves also made skis for sailing down the western slope on a snowy day. “The big hill was too steep to cultivate and the grass was short from the cattle grazing, thus making it a good place to go skiing and with deep snow, it could be excellent.” The western slope also provided a great place for constructing snowmen. “… this was the spot we started the snowball and by the time we got to the bottom the ball was so big we couldn’t move it … It kept on rolling, getting larger as it went down hill.” The children sensibly started the second snowball only halfway down the hill to make the snowman’s head! Nowadays I see evidence of kids sledding on that hill and still see the occasional remains of much smaller snowmen. “Our Little Lake” in the 1940s – the Center Pond with very few trees! The Center Pond today from roughly the same spot, we think. When summer dried Bear Creek marsh (which they called Bear/Bare Swamp), “we could walk all over the swamp. The grass was so tall we couldn’t see out.” They came across various snakes, “mostly blue racers. We were never afraid of them because they were so fast and afraid of humans so they always went slithering on ahead of us.” The marsh no longer dries completely in the summer but the grasses and reed do get tall! The marsh dried in summers in the 1940s. A wetland where the Comps made willow whistles. Nearer to the house, was “Whistle Swamp” so named because “… Dad took us there and showed us how to make whistles from the willow branches. 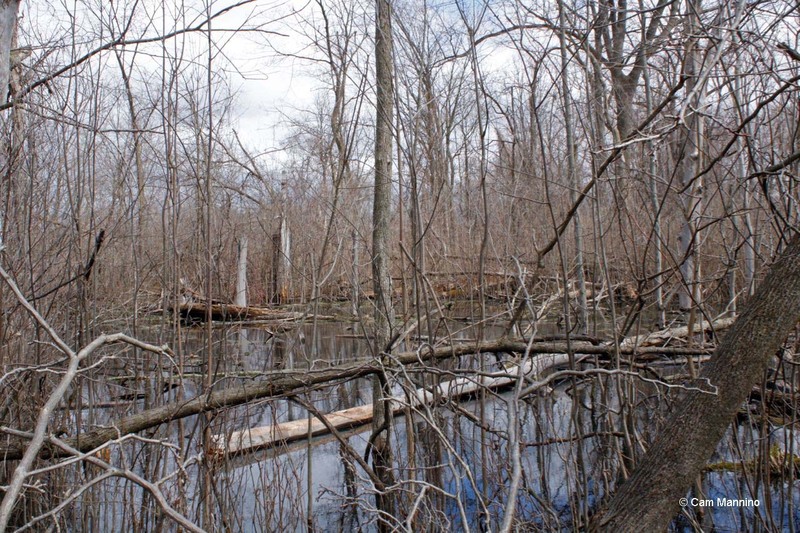 This could be done only in the early spring when the bark…was loose and we could slip it off very easily.” “Whistle Swamp” seems to be the wetland west of the Walnut Lane, about halfway down. Indiangrass, a beautiful native grass that lends color to the late summer landscape. Current Parks Commissioner Barkham also remembers seeing smoke repeatedly during the summers when she was a girl years later, as sparks from the trains made tall grass along the tracks catch fire. And imagine, no township fire department, just locals with brooms and shovels! That’s one reason we still have so many beautiful native plants growing along the Paint Creek Trail now! Many of our native plant communities depend on fire, whereas some invasive plants do not. The Parks and Recreation Commission now depends on safe, controlled prescribed burns instead of wildfires to hold onto our natural heritage, the amazing diversity of native plant and animals in Oakland Township. In the 1940s wetlands were often seen as a problem and drained. Now we know they are crucial and beneficial for erosion control, fisheries, wildlife habitat, flood control, ground water filtering, native and rare species habitat and much more. The Comps affectionately named lots of “swamps” on the farm. 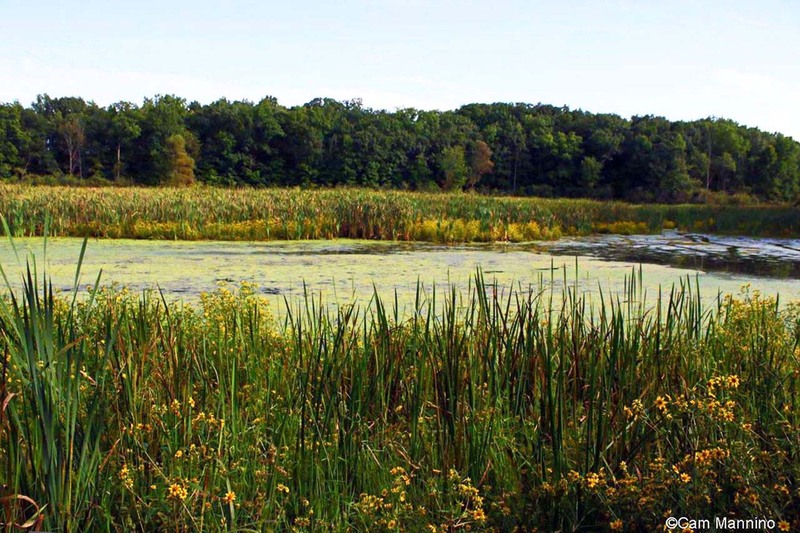 True swamps are forested wetlands with standing water at least part of the year, while wet meadow and marsh more accurately describe other wetlands that Mr. Comps explored at Bear Creek. I can’t be sure I’ve located all these correctly, but what follows are a few of George Comps’ “swamps” today. West of the house was the hay barn, where the cows that grazed the western slope presumably were kept. That area now is the playground field near Snell Road; the road is much wider now than it was in the 1940s. Behind the barn in the center photo below you can see the tops of two giant oaks that are still there. Those giants stand over the marsh that the Comps’ children called “the barn swamp.” Mr. Comps mentions that Michigan Holly, a native bush, grew in the middle of that area, so I’ll look for it in the spring! “Across from it was The Duck Swamp where all Mike’s ducks would go when they wanted to take to water.” Since this one’s so close to the house location, I’m thinking that his younger brother’s domestic ducks took off to the wetland just west of the Snell path into the park where Wood Frogs (Lithobates sylvaticus) were singing lustily this week. Or perhaps he meant the wetland, just north of there, where today woodpeckers are constantly drilling in the trees. Not much open water for ducks now, though. It’s filled in with native buttonbush (Cephalanthus occidentalis). This could also be “Duck Swamp” though it’s a bit farther from the house site. The same “big huge oak,” that George Comps saw near the Center Pond 75 years ago – only “bigger and huger” now! The “Little Lake,” our Center Pond now, shows how different the landscape looked when Bear Creek was farmed 75 years ago. Here’s another view of “The Little Lake” in 1940 and a closer shot of it today. 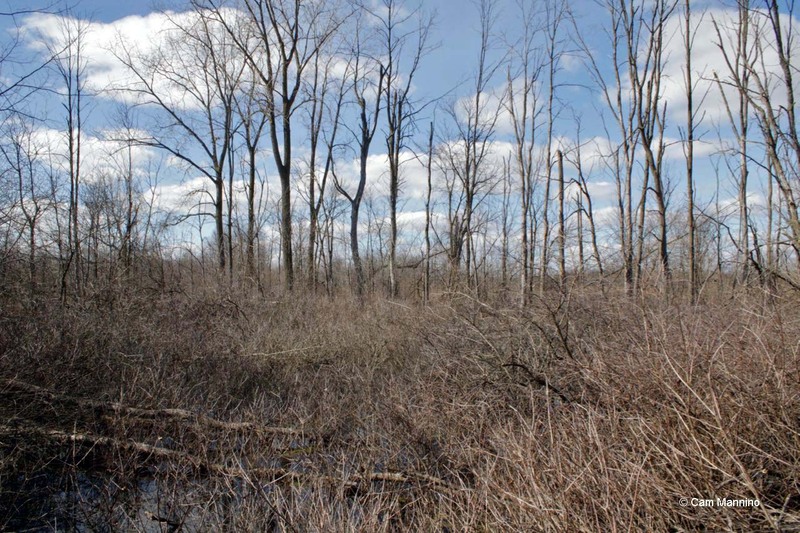 Now the pond is surrounded by trees and thickets of dense bushes, some native ones and many invasive shrubs. The cultivated fields, once grazed by cattle or mowed for hay, are now full of wildflowers, again some native, many non-native, and some invasive. When the Comps children took the moonlit walk to the Little Lake, George Comps waited on the south side of the lake while his sister found her favorite place on “the Big Rock” on the north side of the pond. 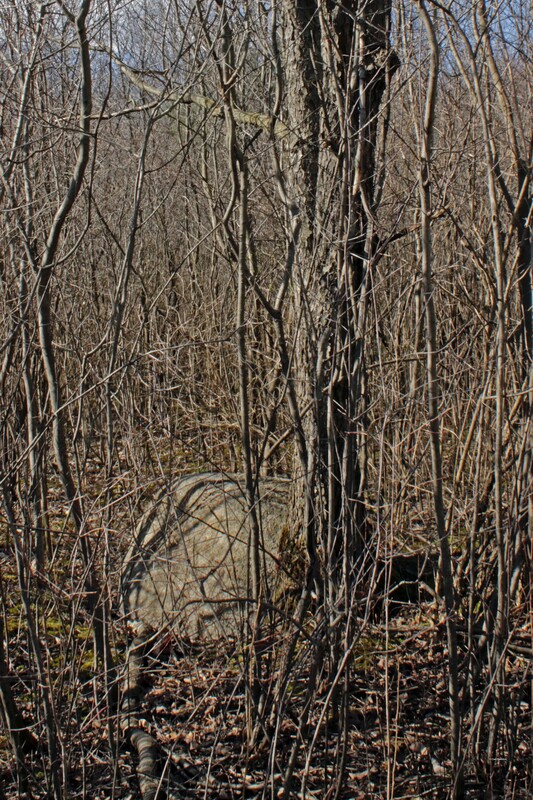 Today, that rock, I’m quite sure, is still here, a short distance up the northern loop and surrounded by invasive bushes. George’s sister sat there to watch the water. Today, it can’t be sat upon and the view is obscured by woody shrubs. Eventually, stewardship will bring back some of openness that the Comps children enjoyed, though rather than simply grazed fields, we hope for widely spaced trees and native wildflowers with their faces to the sun. We, of course, don’t rely on Bear Creek Nature Park in the same way the Comps family had to, for food, warmth and pocket money. But it still provides its bounty for us by filtering and slowing stormwater, housing bees and other native pollinators to tend our crops, providing us with a healthy respite from our busy lives and many other ways. We leave the flowers and nuts to seed again and the bees, muskrats, crows and ground hogs live undisturbed within its boundaries. But they and all of the nature at Bear Creek still share the same beauty and peace that the Comps family treasured 75 years ago. “Mom liked to go wandering down to the woods. She was a decidedly observant person and never missed a thing when it came to nature. This was her way to relax and get away from the trials and tribulations of the day to day problems…” All of us who enjoy Bear Creek benefit in just the same way today. My thanks to Mr. Comps for writing down such a lively and frank account of life on a plot of land much beloved by our citizens – and to his long-time friend, Janet Potton, who gave me permission to use photos and quotes from the book. What are you doing January 15 and 16 of 2016? If you’re interested in working together to care for our lands and waters, you might want to pencil in the 2016 Stewardship Network Conference. 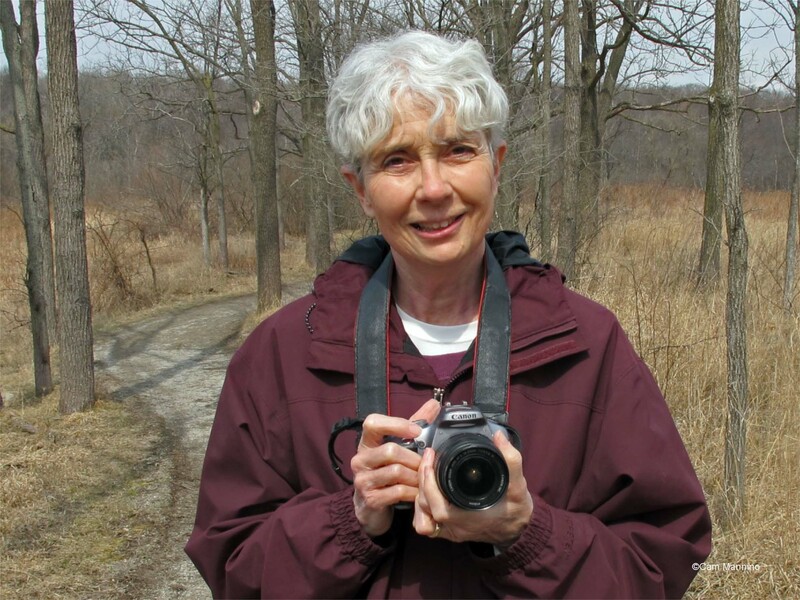 Last Friday and Saturday I attended this conference for the first time and enjoyed connecting with everyone in the conservation-oriented crowd of Michigan and surrounding states and learning more about natural areas stewardship. Federal, state, and local governments were well-represented and were joined by land conservancies, watershed councils, universities, students, ecological restoration companies, utility companies, and private citizens hoping to learn more. Here’s a synopsis of my conference experience. We kicked off the conference with a rousing keynote by Mark Shepard, founder of New Forest Farm and author of the new book Restoration Agriculture. 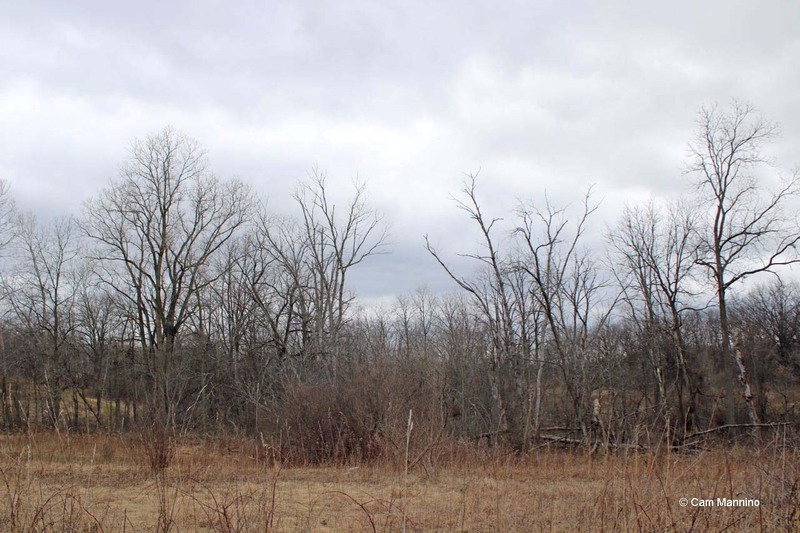 Mark converted eroding row-crop agriculture fields at his Wisconsin farm to a perennial agriculture model mimicking oak savanna in an attempt to do profitable sustainable agriculture that enhances habitat for native plants and wildlife instead of degrading habitat. 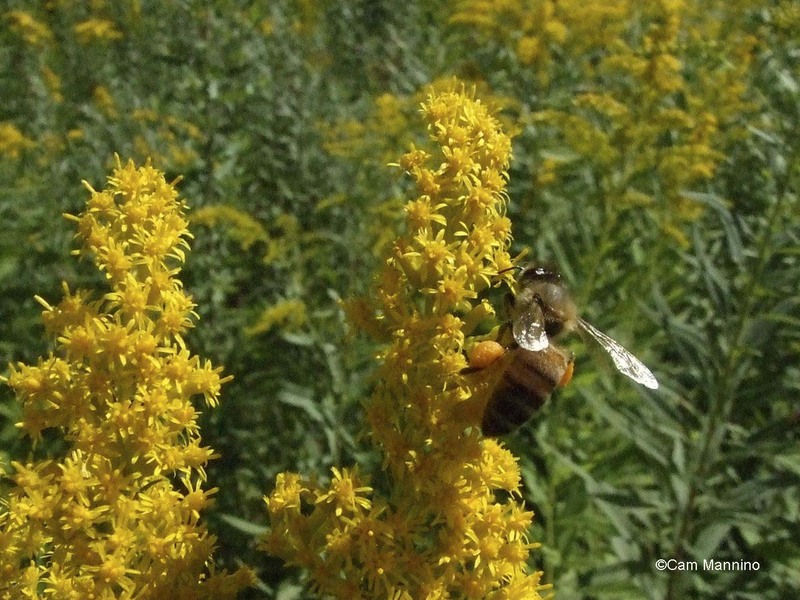 Traditional agriculture has a problem: it works against nature for short-term profit, resulting in a system where our soil runs down the river to lakes and oceans at the rate of tons per acre every year and where our native pollinators are disappearing at an alarming rate. Take home message: by working with nature instead of against it, we can do profitable, sustainable agriculture. For the rest of the conference I focused on connecting with people doing on-the-ground natural areas management. At the invasive species roundtable discussion I learned about techniques that have been successful for others, and techniques that haven’t worked. At the oak savanna round table discussion we talked about doing oak savanna restoration at a large enough scale so that natural processes are working with you instead of against you. I also learned about two oak savanna related books that I’ll be adding to my library soon: Prairies and Savannas in Michigan (O’Connor, Kost, and Cohen 2009) and Forgotten Fires (Stewart 2009). I spent time learning about some important considerations when using prescribed fire in Michigan, including burning techniques that minimize damage to sensitive amphibian and reptile populations. 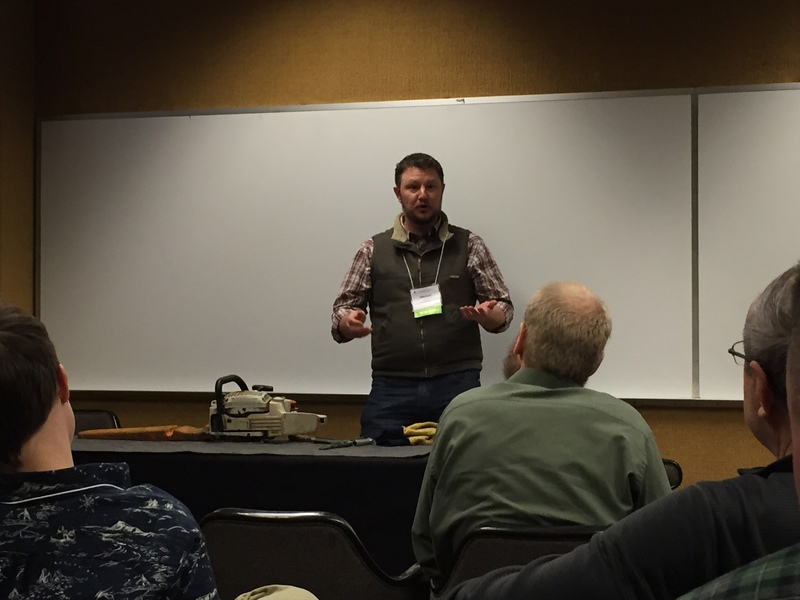 I picked up practical tips about maintaining the equipment needed to do prescribed fire and natural areas management. Finally, I spent time learning about building a volunteer program. I want to build a program that gets you connected with the natural areas in your parks and helps you know that when you come out to volunteer, you are making a difference and are an important part of our mission. 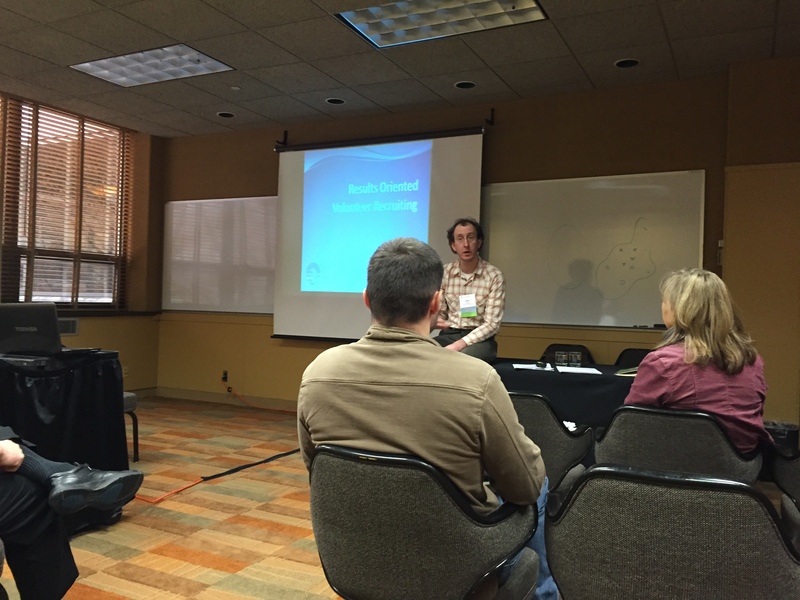 Jason Frenzel of the Huron River Watershed Council has been managing volunteers for years and led an excellent workshop about designing an effective volunteer program. Jason Frenzel with the Huron River Watershed Council led an excellent workshop on Results Oriented Volunteer Recruiting. The best part of the conference was making new friends and connecting with people I hadn’t seen in years. The folks with The Stewardship Network did an excellent job hosting this conference. Their hard work and attention to detail were evident. Thanks! *Any mention of specific products, people, or services does not imply an endorsement or agreement. I mention them to help you and me focus our learning about natural areas and the processes that make them tick. Let’s learn together! Learn more about reasons for using prescribed fire, preparations for conducting a fire, necessary tools, roles of each burn crew member, and ignition patterns. Join us at 7 pm on Thursday, January 22, 2015 at the Paint Creek Cider Mill. Please RSVP to bvanderweide@oaklandtownship.org by Tuesday, January 20. I’ll be bringing gear that we use to conduct prescribed burns, including backpack pumps, protective clothing, and hand tools. Don’t miss this opportunity! 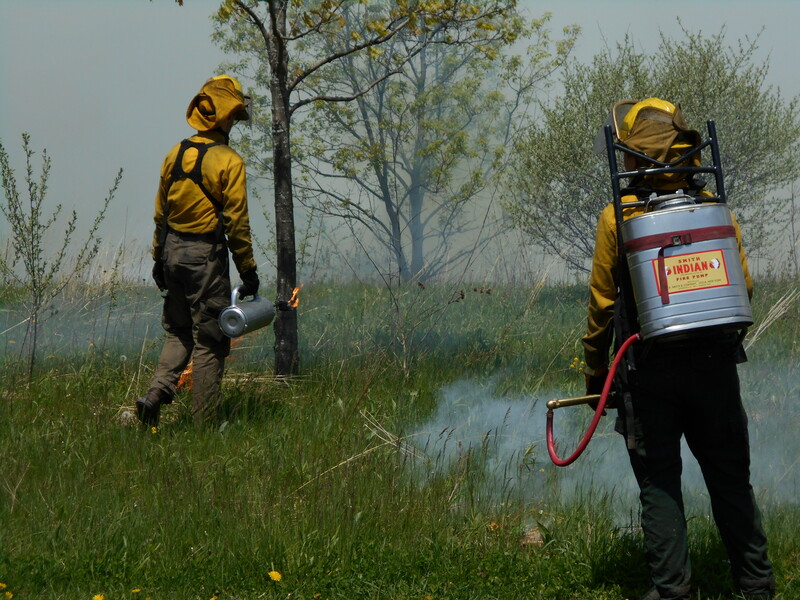 We are committed to the safe use of prescribed fire in our township parks and we want you to know about the process involved in conducting a prescribed burn. The ignition crew communicate closely with the holding crew to make sure the fire does not burn in areas outside the burn unit. 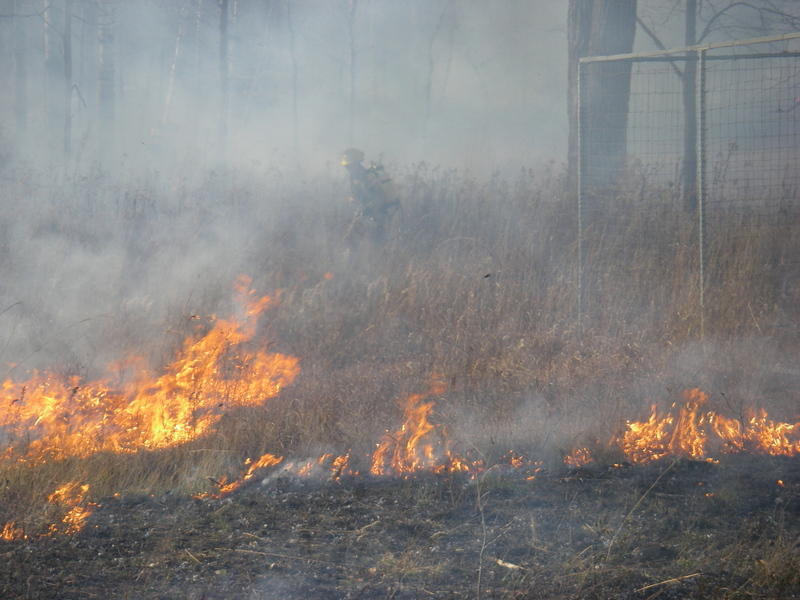 Prescribed fire at the Paint Creek Heritage Area – Wet Prairie on November 5, 2014.